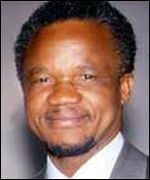 Frederick Chiluba on Zambian People Pages - Zambia, Africa at Zambian.com, a Zambian Website. Online information map about Zambia, Africa, Zambians, country friends. Facts, people, news, culture, etc. President Frederick Chiluba stands only at five-feet tall but his stature as a world leader continues to grow. As second president of Zambia, Chiluba took over the helms of struggling Zambian economy and has for the most part steered into it towards waters of hope. When he assumed power on Nov. 2, 1991, he promised to revamp the economy by privatizing most of the state-owned companies and encouraging foreign investments. While he has followed through with most of his promises for privatization, the bitter pill that came with the tough decisions has left more than just a sour taste in the mouths of many Zambians. They simply do not have food to put in their mouths. Privatization has led to thousands of Zambian workers to be laid or retrenched; depending on which side of the management you are. In fact, the current figures show that only 48 percent of Zambians are in formal employment. Chiluba, the former trade unionist, told Zambians it would be tough. Moreover, it has not been easy even for him. While there has been a dispute about where he was born, (Some candidates in the 1996 presidential elections challenged his eligibility claiming that he or his real father was born in Zaire. Petition Details) there is no doubt that he was raised on the Copperbelt and this contributed to his taking up of unionism. Born Frederick Jacob Titus Chiluba on April 30, 1943 to Jacob Titus Chiluba Nkonde and Diana Kaimba, he went to school in Kawambwa Secondary School where he was suspended for student activities. He later completed his General Education Certificate via correspondence and studied economies in both the United States and former Communist countries. He worked as personnel clerk before becoming an accounts assistant at Atlas Copco in Ndola where he joined the National Union of Building, Engineering and General Workers rising through the ranks to the post of chairman of the union. He went on to win the chairmanship of the Zambia Congress of Trade Unions (ZCTU). In 1987, he successfully withstood challenge to his chairmanship of NUBEGW that would have put his ZCTU position in jeopardy. Chiluba and several leaders in ZCTU were detained in 1981 by then President Kenneth Kaunda for calling a wildcat strike that paralyzed most of the Zambian economy. The union leaders were released after judge ruled their detention as unconstitutional. In 1990, he helped form the Movement for Multiparty Democracy that went on to successfully challenge the one-party government. Chiluba was elected president on October 31, 1991. He won re-election to second five-year term in 1996 despite a lawsuit questioning his birthplace and hence his eligibility for the post. In late 2001, Chiluba divorced his wife Vera with whom he has nine children. He stepped down at the end of his term on Jan. 2, 2002, and was replaced by Levy Mwanawasa, his one time vice president. Although Chiluba started out as a socialist, his policies have turned capitalist, stressing free enterprise with less government interference. Politically, Chiluba leaves with a muddled legacy. He successfully brokered a peace agreement for neighboring Congo but failed to stop the escalating crime in Zambia. He was elected chairman of the Organization of African Unity but failed to win support in his bid to amend the constitution allowing him to run for a third term. In the opinion of many Zambians, Chiluba is leaving State House a wealthier man and Zambia a poorer nation.